In one of the most repugnant cases in recent memory, a Wisconsin DA is accused of sexting an abuse victim and trying to start an affair with her — and he's going unpunished. According to the AP, Calumet County District Attorney Kenneth Kratz interviewed 26-year-old Stephanie Van Groll in 2009, when he was prosecuting her ex-boyfriend for strangling her (the ex was later convicted). After their meeting, he began texting her. The text started out friendly, if still somewhat inappropriate — Kratz wrote "you have such potential" and "I wish you weren't one of this office's clients. You'd be a cool person to know!" But things quickly got worse — he asked, "Are you the kind of girl that likes secret contact with an older married elected DA ... the riskier the better?" (we weren't aware this was a "kind of girl"). He told her not to tell anyone about the texts, and began to belittle her, referencing her "low self-esteem" and saying, "I'm serious! I'm the atty. I have the $350,000 house. I have the 6-figure career. You may be the tall, young, hot nymph, but I am the prize!" Concerned that Kratz would drop the case against her ex if she didn't sleep with him, Van Kroll went to the police. 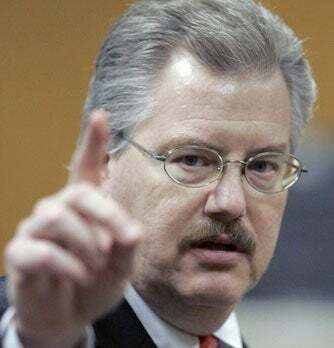 Here's the worst part: Kratz won't be charged with anything, and while he took himself off her case and resigned from the Wisconsin Crime Victims' Rights Board (which the AP describes as "a quasi-judicial agency that can reprimand judges, prosecutors and police officers who mistreat crime victims"), he remains the top prosecutor in his area and plans to run for reelection. And he doesn't think he did anything wrong. Of the 30 text messages Kratz sent her, Van Groll says, "I had three days of hell." Patti Seger of the Wisconsin Coalition Against Domestic Violence says, "If what's being alleged is true, it's sad a prosecutor would use the same sort of power and control over a woman who has already experienced that in her personal life." But Kratz, who didn't deny the allegations, said "This is a non-news story." He added, "I wrote the law on crime victims in Wisconsin. That's the irony here." It is ironic, but not the way he thinks.